Louisville, Kentucky, and Birmingham, Alabama, have ambitiously expanded upon their Frederick Law Olmsted Jr.-designed park systems in ways that both reinforce this great designer’s legacy and provide lessons for other communities. At the Frederick Law Olmsted, Jr.: Inspirations for the 21st Century symposium held at the National Building Museum in Washington, D.C., Dan Jones, chairman and CEO, 21st Century Parks; Philip Morris, Hon. ASLA, former executive editor of Southern Living Magazine; and Eric Tamulonis, ASLA, principal, Wallace Roberts Todd (WRT), explained Olmsted Jr.’s continuing contribution to contemporary park systems and interconnected parkways. 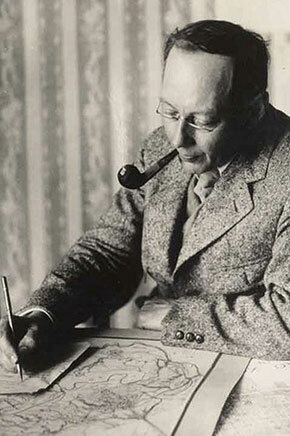 Working in the era of the “recreational reform park”, Olmsted Jr. helped to systematize a new approach to municipal park and recreation planning. Building on his father’s 1893 system plan for Louisville, Olmsted Jr. provided a finer grain of public amenity by way of community and neighborhood parks, recreation grounds, and squares. Progressing to a more comprehensive, statistically-based approach to addressing municipal recreation needs, Olmsted Jr. also created a comprehensive system plan for Birmingham, addressing long-term regional growth and recreation needs by targeting a range of park opportunities well beyond the city. According to Tamulonis, Louisville had implemented Olmsted’s plan “almost in its entirety” and became known as the “city of parks,” whereas Birmingham, called the “River of Steel” for its industry, did not implement as much of its own plan. 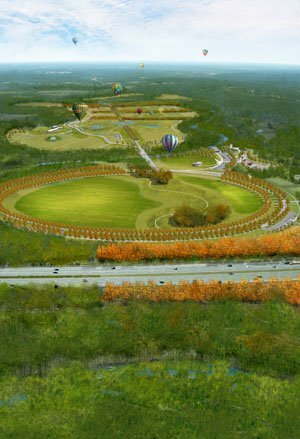 Jones described the Parklands of Floyds Fork, a public park system totaling nearly 4,000 acres across four parks in eastern and southern Louisville, a project WRT has been designing and creating for years. He outlined several principles central to Olmsted Jr. For instance, the urban world of the twenty-first century is “directly analogous” to the world faced by Olmsted in the twentieth century. Parks are “shaping city infrastructure, are equal to other infrastructure, and should be built in advance of growth.” Planning parks systematically is superior to individual park design. Morris outlined the development of Olmsted Jr.’s plan for Birmingham, and how the plan was republished in 2005 by the Birmingham Historical Society. He described the city, with its 38 different municipalities, as “fragmented,” but noted that “regional connections can be created even without a central government.” For example, agreements were signed between municipalities, and many stakeholder meetings were held to develop a master plan for the Red Rock Ridge and Valley Trail System, a regional greenway and street-based trail system to connect communities across Jefferson County. Image credits: (1) Frederick Law Olmsted, Jr. / Newport Arboretum, (2) ASLA 2009 Professional Analysis and Planning Honor Award. Parklands of Floyds Fork / WRT, (3) ASLA 2012 Professional Analysis and Planning Honor Award. 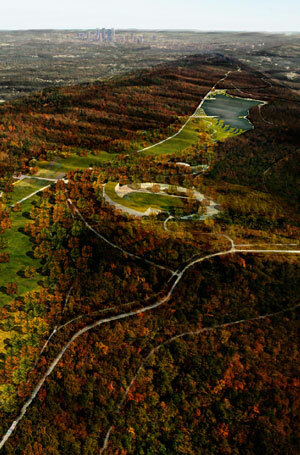 Red Mountain / Green Ribbon — The Master Plan for Red Mountain Park / WRT.